Idiyappams are a sort of rice noodle patties, very delicate in taste as idlis. Here too patty mold is steamed, though with fresh grated coconut at the bottom. Then, another, to me so far unknown, kitchen utensil is used. It is a cross between a potato masher and a corkscrew that pushes the dough made of rice flour and water through small holes to create fine noodles. Idiyappams, just as idli, are typical Keralan breakfast items, and are usually served with curry or chutney. 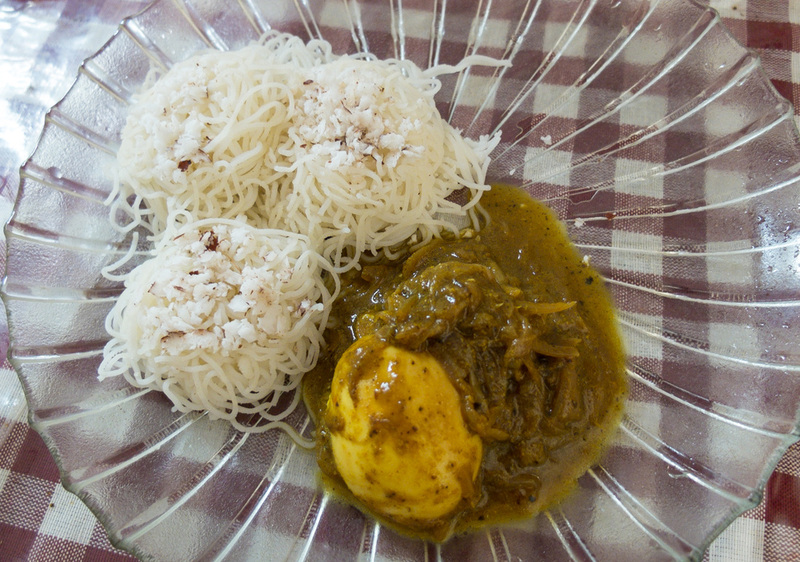 Here, we are suggesting an egg curry, very fragrant and rich in flavors, yet not spicy at all. 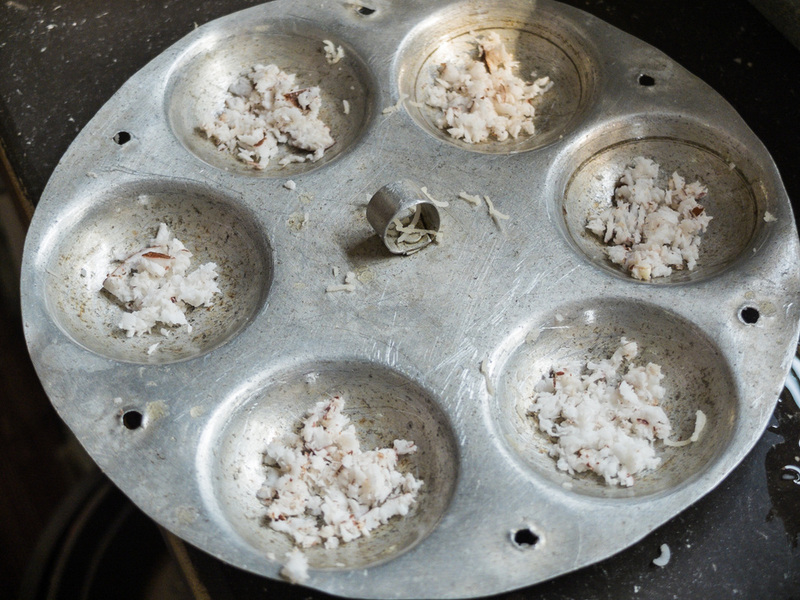 And the idiyappams themselves, enriched by the delicately sweet notes of coconut, are very delicious too. Despite my life-long loyalty to Italian style breakfast (i.e. pastry and a cappuccino), I too was very fond of this quite brilliant breakfast item. 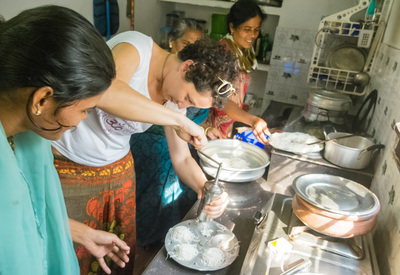 Mix the rice and water in order to get a compact but not hard dough. 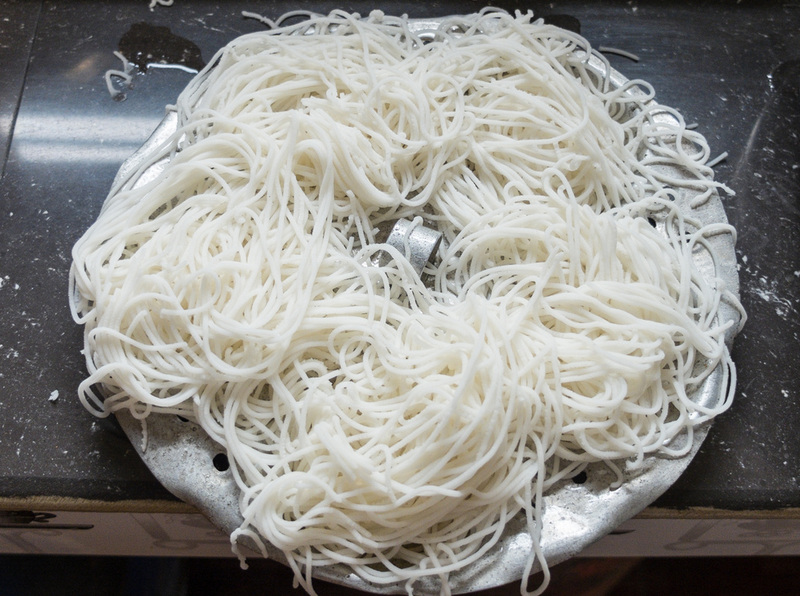 Use the Idiyappam press (a kitchen utensil that looks like a potato masher only with much smaller holes in it) to squeeze the though through in order to make the ultra fine noodles. 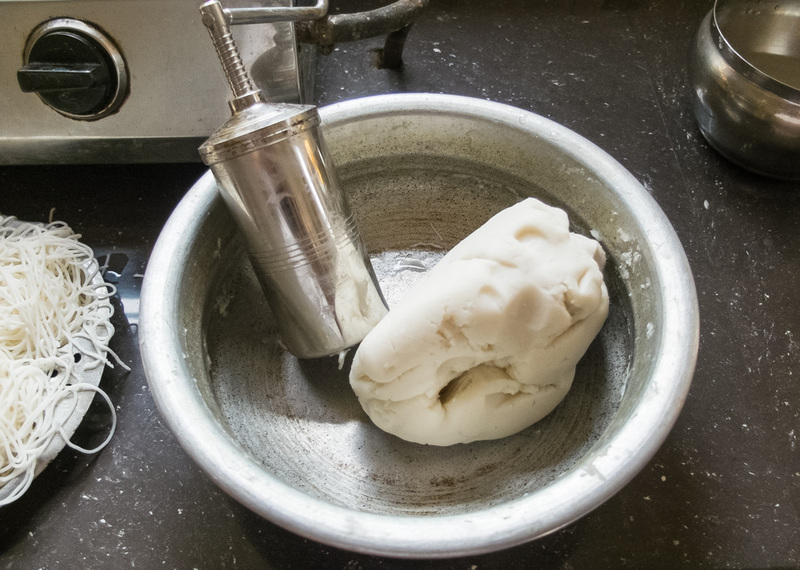 You will also need the idli mold - a mold with 4-5 round concavities that form small patties. Make sure to oil them before sprinkling grated coconut on them and then squeeze the noodles on top. Steam cook for 5-7 minutes. 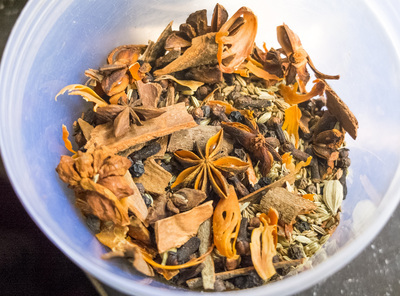 Put the masala ingredients in a blender and add water until you get a paste (i.e., the masala). Sauté the finely chopped onion and curry leaves in coconut oil. When the onion is well browned, add the masala, a crushed green cardamom, water and salt. Leave to cook for 10 minutes, until the right consistency forms, and at the end, add the hard-boiled eggs cut in halves or quarters. Serve idiyappams with curry or chutney. 6. the breakfast is ready!